includes one Company Command Pistol team, one Platoon Command Pistol team, one Optional Sniper team, two Rifle Sections, two Small three-hole bases, one Small two-hole base, eight Medium four-hole bases & one Base Plug sprue. 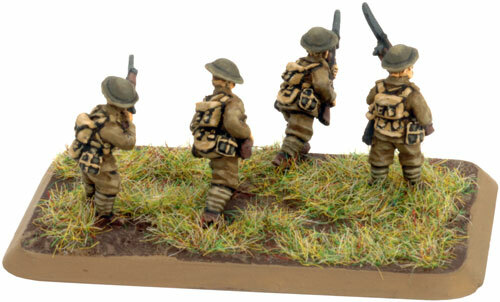 After three long years of war, the British infantry are worn, but their courage has not dimmed. They can look to their officers to provide an example. The company’s major will draw his revolver and lead the men forward, as he has always done, to glorious victory. The Great War of 1914-18 was global in its reach. Yet this global conflict would be decided by the mighty clashes upon the battlefields of Europe. Jerry has thrown everything at us – machine gun bullets at the Somme, shells at Verdun, and their vile poison gas at Ypres – but ‘Tommy’ has held firm. The traditional qualities of British infantry-courage, discipline and marksmanship-have stood them in good stead along with their trusty ‘303’ Enfield rifle. Now, with Lewis light machine-guns, bombers, rifle grenades, and hard won experience, we are pushing the enemy back along the front. Our new recruits make up in dash what they may lack in experience. When the whistle blows, they will be ready to charge through the mud to the green fields beyond. Left & below left: The Company Command Pistol team. Pistol team 4"/10cm 2 1 6 Full ROF when moving. Note: The HQ & Rifle Platoon blister pack contains two command teams. This is deliberate so you can create the compulsory units required to field a Rifle Company in Great War by purchasing just two Rifle Platoon blister packs. 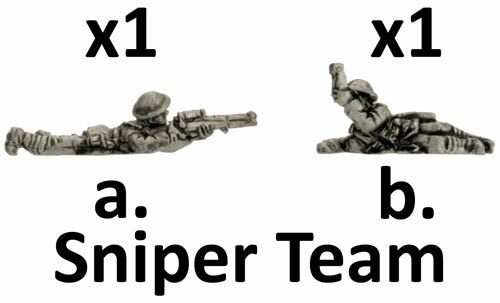 From the two blister packs you will be able to create a Rifle Company HQ with a Company Command Pistol team, a 2iC Command Pistol team in addition to two full strength Rifle Platoons each with a HQ section (using the other two Command Pistol teams) and two Rifle Sections. 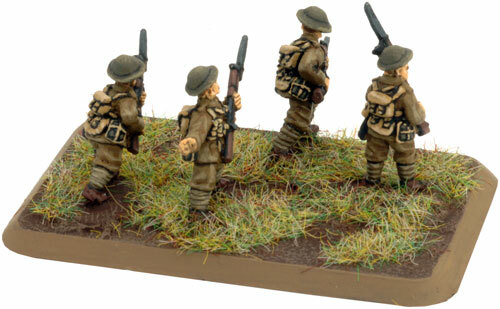 Rifle Grenade team 12"/30cm 2 1 4+ Can fire over friendly teams. 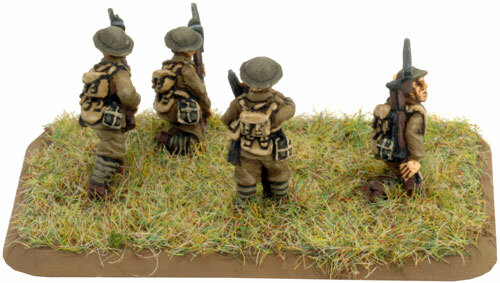 MG team 16"/40cm 3 2 6 ROF 2 when pinned down. Contact the customer service team at [email protected] if you have any issues with any of the components. a. 1x Company Command officer figure. b. 1x 2iC Command officer figure. To assemble the Company Command Pistol team, simply arrange the Company Command Officer figure, one NCO Rifleman figure and one Rifleman figure on one of the Small three-hole bases provided in the blister pack. 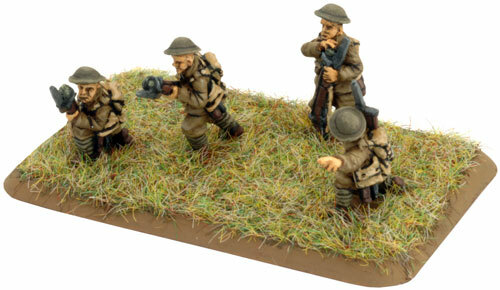 To assemble the 2iC Command Pistol team, simply arrange the 2iC Command Officer figure, one NCO Rifleman and one Rifleman figure on one of the Small three-hole bases provided in the blister pack. Right: Examples of assembled Command Pistol teams. a. 1x NCO figure with hand pointing backwards. b. 1x Advancing NCO figure with hand pointing. 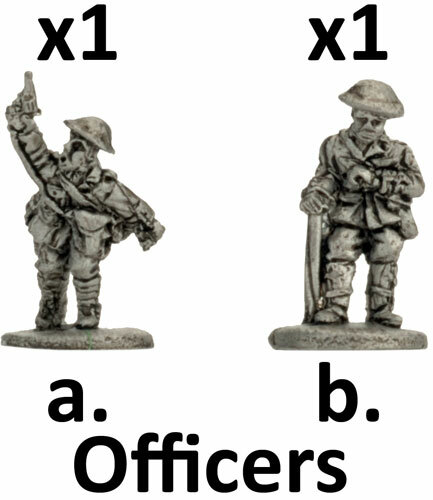 c. 2x Standing NCO figures pointing forward. d. 1x Advancing NCO figure with hand in air. 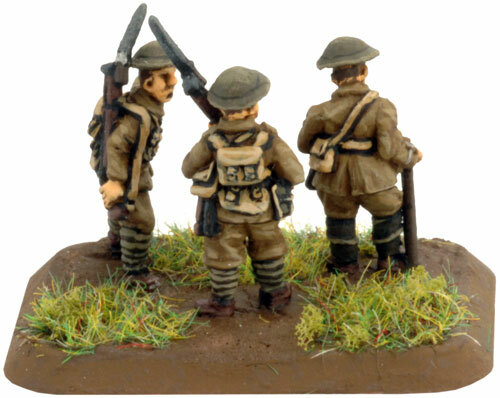 e. 2x Kneeling NCO figures pointing. 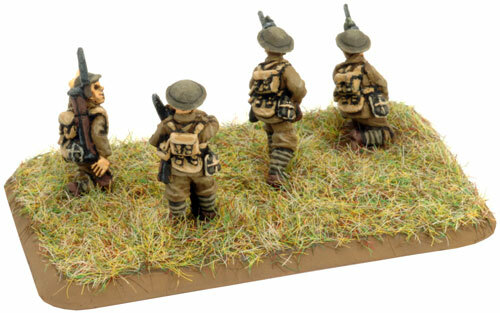 Note: NCO figures are contained in Command teams as well as being spread out amongst to rest of the units. a. 1x Prone Sniper figure. b. 1x Prone Observer figure. The Rifle Company HQ has the option to add a Sniper team for +60 points. 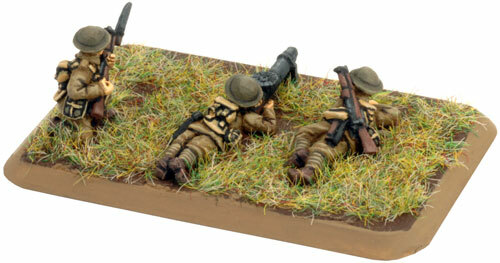 To assemble the Sniper team simply arrange the Prone Observer figure and Prone Sniper figure on the Small two-hole base. Left An example of an assembled Sniper team. Tip: Use the base plugs to fill both the figure holes on the Small two-hole base in order to attach the Observer and Sniper figures directly to the base. a. 1x Kneeling Rifleman figure. b. 1x Kneeling Rifleman figure throwing grenade. c. 1x Kneeling Rifleman figure aiming rifle. 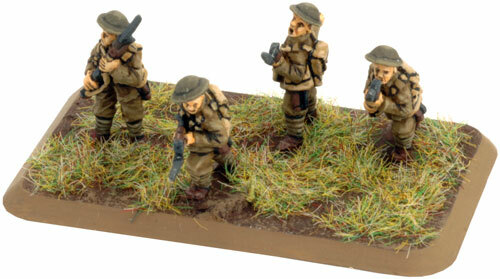 d. 3x Standing Riflemen figures. 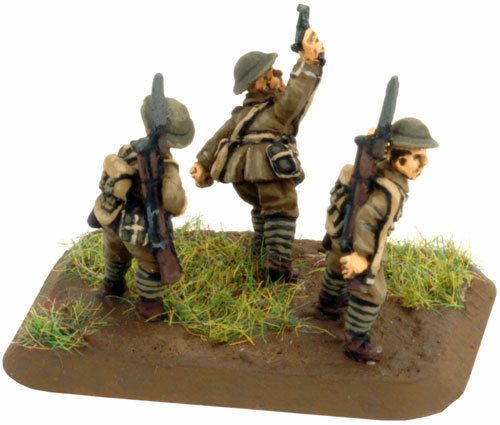 e. 2x Riflemen figures pulling pin on grenade. f. 2x Advancing Riflemen A figures. 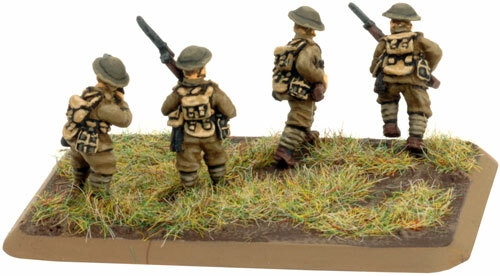 g. 2x Advancing Riflemen B figures. i. 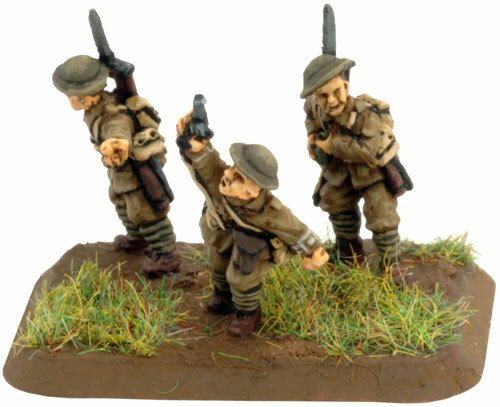 2x Standing Rifleman figures aiming rifle. j. 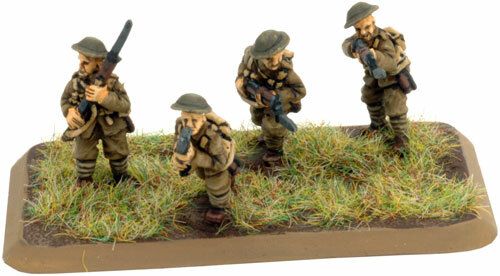 2x Advancing Riflemen C figures. A Rifle Platoon consists of the HQ Section containing the Command Pistol Team (which we've already covered) and two Rifle Sections. Each of these Rifle Sections contains two Rifle teams, one MG team and a Rifle Grenade team. 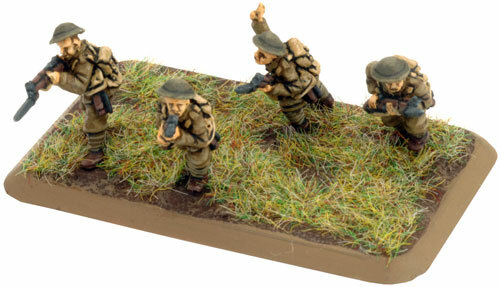 The first Rifle team needs to contain one NCO figure and three Riflemen figures while the second team simply contains four Riflemen figures.The Rifle teams are modelled on the Medium four-hole bases included in the blister pack. Below: An example of an assembled Rifle team with an NCO. Below: An example of an assembled Rifle team without an NCO. a. 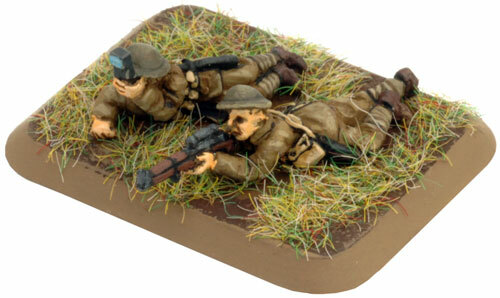 2x Prone MG gunner figures. b. 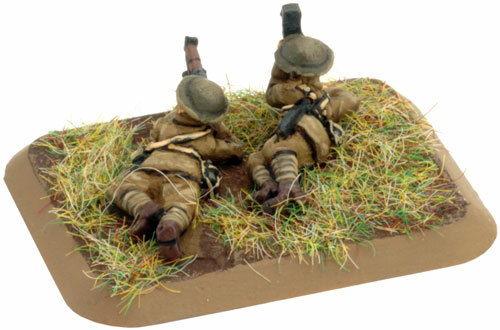 2x Prone MG loader figures. The MG team is made up of the two-man MG team (the prone gunner and loader figures) and one rifleman figure. 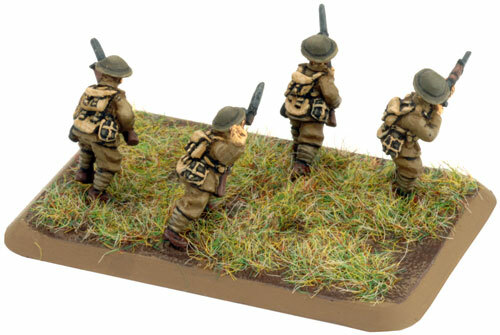 The MG team are modelled on the Medium four-hole bases included in the blister pack. 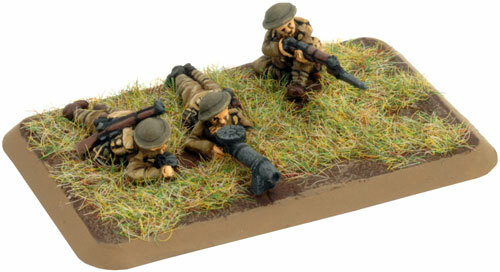 Tip: Use the base plugs to fill the figure holes on the base intended for use for the MG team in order to attach the prone MG gunner and loader figures directly to the base. 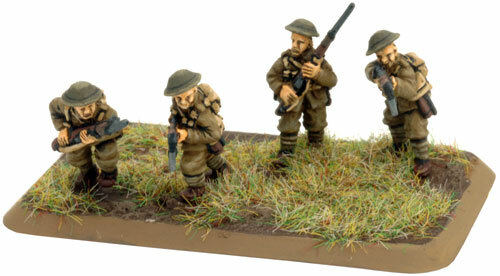 Left: An example of an assembled MG team. a. 2x Kneeling Rifle Grenade figures. b. 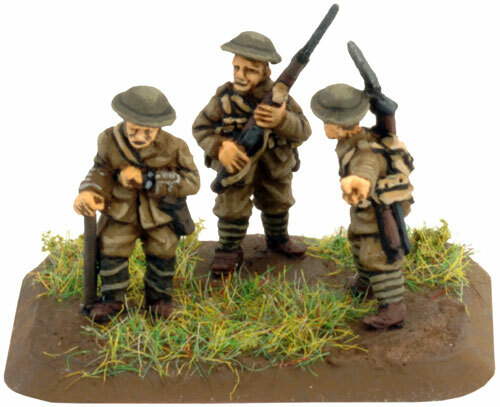 2x Standing Rifle Grenade figures loading grenade. 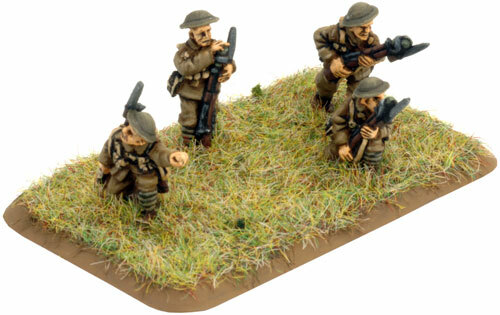 c. 2x Advancing Rifle Grenade figures. 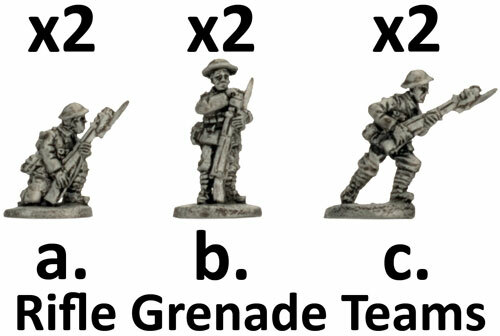 To represent this team, simply arrange the three Rifle Grenade figures and one NCO figure on a Medium four-hole base. Left: An example of an assembled Rifle Grenade team. a. 2x Small three-hole bases. c. 8x Medium four-hole bases. d. 1x Base plug sprue.